Are you a star gazer? If yes then you are in for a real treat this weekend. 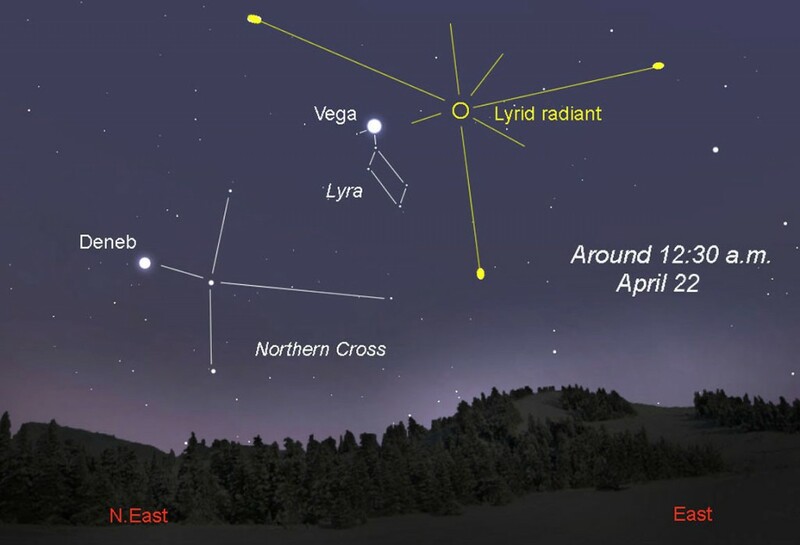 Beginning tonight, people in the northern hemisphere, including Greece, are going to be treated to a spectacular celestial show, as the annual Lyrid meteor shower is set to peak on Sunday, April 21 as well as Monday, April 22, (which is also Earth Day). The greatest visibility, according to news reports, is expected to be between Friday night and just before dawn Sunday and Monday. 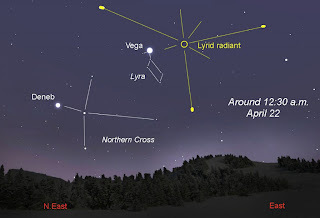 The Lyrids take their name from the constellation Lyra, where the radiant of the meteor shower appears to be located. 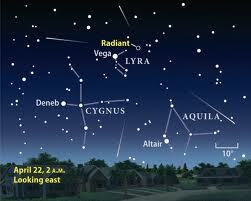 They are a strong meteor shower that occur annually, or between mid-to-late April. The source of the meteor shower that we will witness this weekend is actually the periodic Comet C/1861 Thatcher. (Strange !!!) 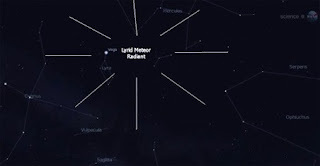 It is the oldest meteor shower recorded by humans, with the first recorded observation being in 687 BC by a Chinese man who wrote of "stars falling like rain". The 'shooting stars' are in actuality the dusty trail of the comet Thatcher. Particles the size of grains of sand shed by the comet shoot through the sky at over 100,000 miles per hour that "light up" when the reach the earth's atmosphere. But be warned, the Lyrids cosmic bonanza show is expected to be a wee bit overshadowed by a nearly full moon. Reports quoting astronomers claim that a fool moon expected on the night of April 25 and a partial solar eclipse that same day as the moon aligns with the sun with the earth between them, might just reduce visibility in the sky. Nonetheless, it is a spectacular site and should not be missed by anyone. So if you live in Europe, Africa, Asia and Australia be advised that the partial lunar eclipse will be visible in large areas. For Greece in particular, the partial eclipse is expected to begin at 11:21 p.m., and peak at 1:11 a.m. on Tuesday, April 26.